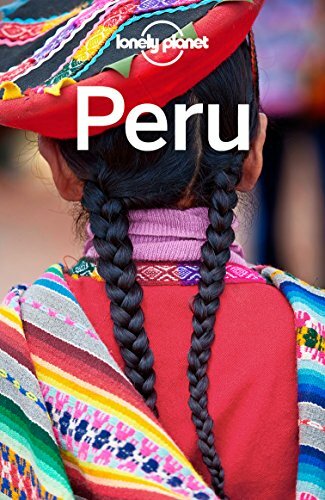 Machu Picchu and the Inca Trail have began feeling the strain of over-tourism and finding alternative Peruvian experiences can often provide a far more rewarding adventure. But it can also help alleviate the pressures caused by too many tourists flocking to the famous citadel. Restrictions have already been placed on travelers wishing to hike the Inca Trail as well as those looking to witness Machu Picchu. Only 200 hikers are allowed to start the Inca Trail each day (500 total people when you include guides and porters). Machu Picchu has also placed limits on the amount of daily visitors as well as recently enforcing guided tours with time limits. When you’re forced into a guided tour and can’t venture off from your group, can’t take a photograph without a million other tourists, and can’t enjoy the view without being elbowed, is it really still worth visiting? 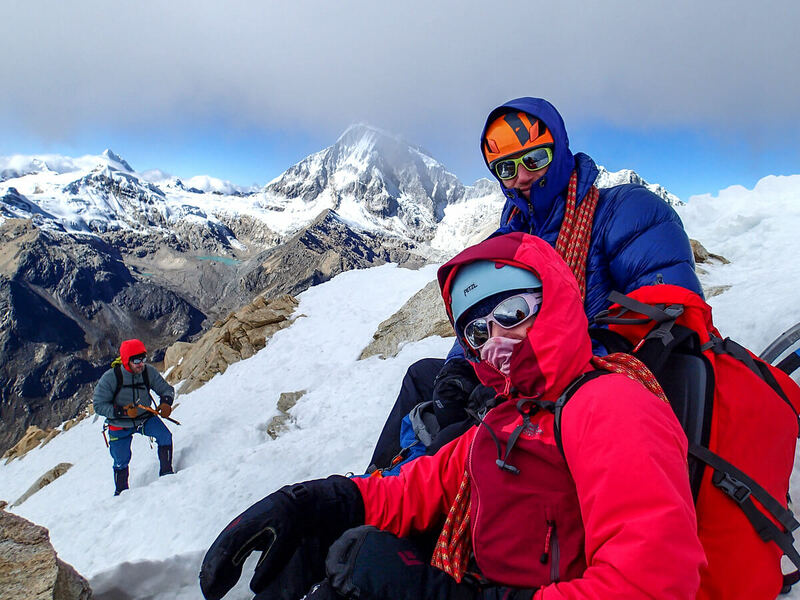 This nearly two week trek has become one of the world’s finest mountain treks, bringing you up close and personal to some of South America’s most remarkable peaks such as Yerupajá. 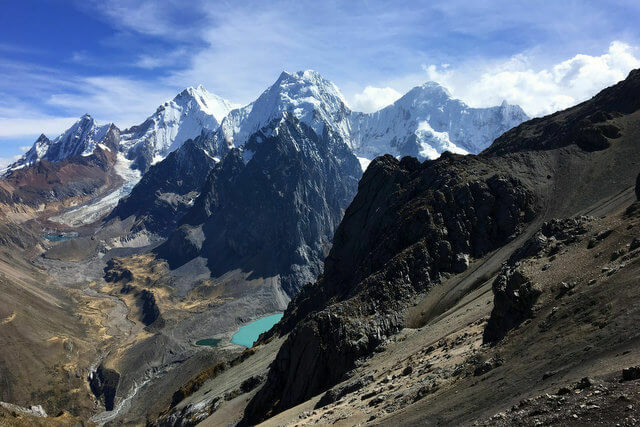 The Huayhuash Circuit Trek reaches heights of 15,000-16,000 feet where you’ll pass pristine glacial lakes and a treeless landscape for uninterrupted views of the many snow capped peaks. If you have ever read Joe Simpson’s famous book “Touching the Void” or seen the documentary, this is where the epic adventure took place. This trek will not only allow you to camp in the same camp as Simpson and Yatches, but you will also experience a great deal of Andean culture. At around 100 miles long, the circuit and its side trails definitely don’t make for a simple stroll, and a good deal of dedication and stamina is required. The scenery and encounters with wildlife such as Andean condors and vicuña make it well worth the effort though. 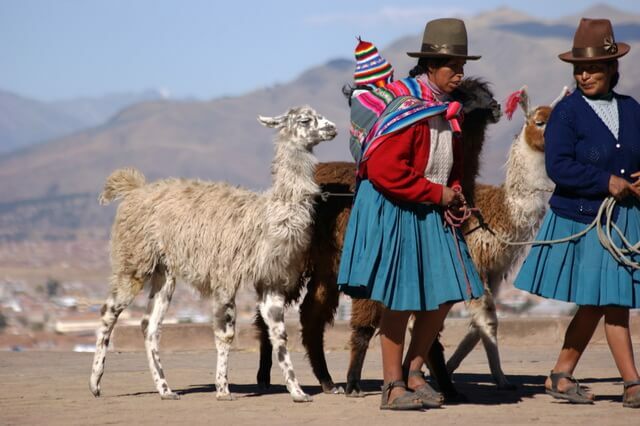 The journey across Peru’s Altiplano is one through earth’s most extensive areas of high plateau outside of Tibet. Here you will be hiking in the cradle of Inca civilization through cities like Puno, along Lake Titicaca; South America’s largest and the highest navigable lake in the world. Getting to Lake Titicaca usually involves a stunning bus or rail journey from Cusco. Travelling by bus allows for stops to take in the beautiful peaks of the Carabaya Range, while the train offers up the world’s fourth-highest rail route. On Lake Titicaca, experience the famous totora reed boats and Uros Floating Islands. There are many ruins to discover and fascinating islands to explore including Taquile Island and Island of the Sun. Enjoy the lake via a relaxing cruise or opt for a more active kayak journey. Journeys to Lake Titicaca usually include entering the much less visited country of Bolivia where you’ll find the highest capital city in the world, La Paz, with its eclectic witches’ markets, cholita wrestling, and stunning landscape of the Valle de la Luna. The city’s high altitude will challenge your leg muscles and lungs while choosing to travel by bike down the famous Death Road will challenge your nerves. Follow ancient Andean-trails and visit Quechua communities as you take in the literally breathtaking scenery of the numerous snow capped peaks that reach well over 18,000 feet along the Alpamayo Circuit. It is here where Peru’s tallest Mountain, Huascarán, stands at over 22,000 feet. In addition, you will witness the insanely beautiful pyramid shaped Alpamayo mountain. Alpamayo is often said to be the world’s most striking mountain and along with turquoise glacial lakes and glaciers themselves, this trek offers up a remote, seldom visited area of Peru with some of the country’s finest landscapes. The roughly week and a half long trek provides wilderness camping at its best, where you can safely witness crashing avalanches in the distance from the safety and comfort of your tent. Those looking for a bit more color in a mountain trek need look no further than hiking to Ausangate and the Rainbow Mountain. Also known as Vinicunca, the trek is a more manageable hike than some of the above options; a 4-5 day hike that is easily accessed from Cusco. 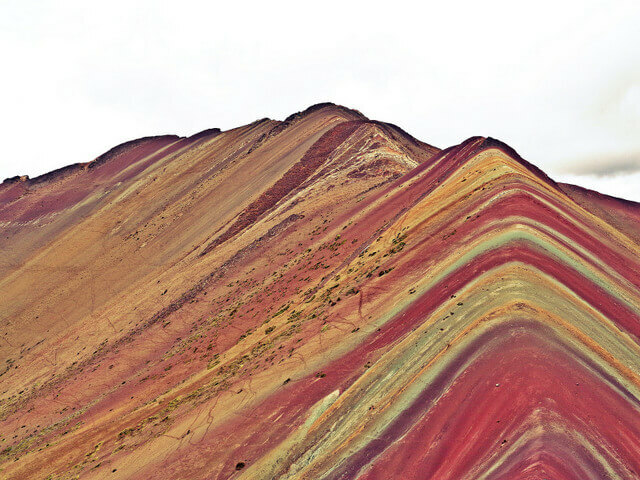 Rainbow Mountain is quite literally painted in shades of purple, yellow, pink, green, and blue. It almost looks as though an alpine color run event just took place there … or maybe the result of the local condors eating too many skittles and expelling them through their digestive tracks across the sides of the mountain. This trek also includes seeing the impressive Ausangate, the largest peak in the Cusco region. You may also see wildlife such as llamas, alpacas, pumas, and more. Unlike the Inca Trail, no permits are required for this trek and you may not even run into another group of hikers. Winning! 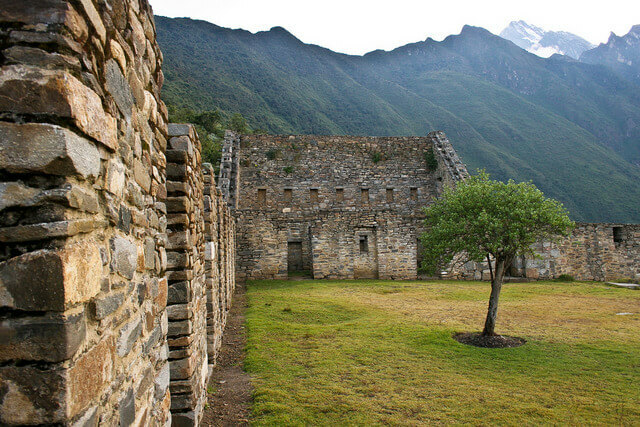 Those looking to visit a citadel much like Machu Picchu without all the hectic chaos should experience Choquequirao. While a bit more of a challenge to reach than Machu Picchu, the ancient Inca site is very similar to MP in terms of architecture and offerings. In fact, it looks almost exactly the same. But with none of the tourism. Seeing Choquequirao requires a 2-day hike which starts just outside of Cusco near the village of San Pedro de Cachora. The experience is well worth the hike and you won’t have to share the journey or the site with many tourists. Less than 10,000 hikers visit the site annually which is far less than the nearly 1.5 million people that flock to Machu Picchu each year. 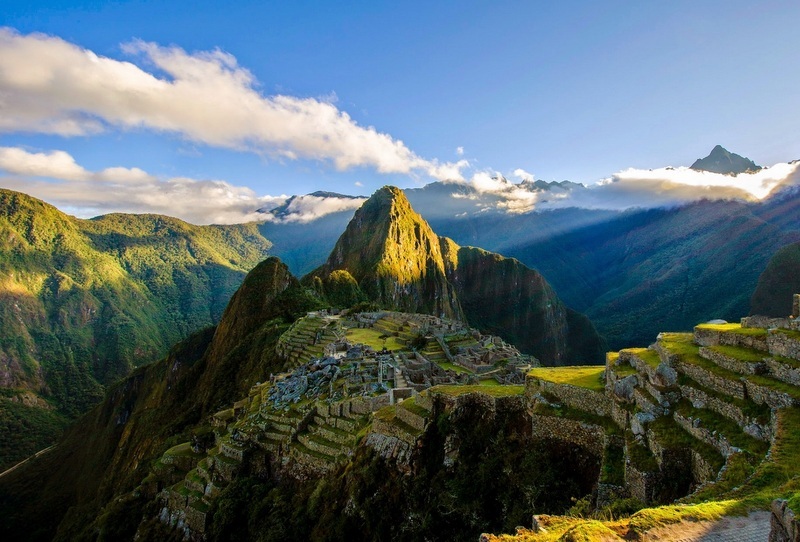 Explore the ancient site which is actually larger than Machu Picchu and even camp there. You may even be blessed with having the site to yourself where you can marvel at the shrines and temples as well as incredible rock artwork depicting motifs of people and animals set in the terraces. Those looking for a longer trek can extend this journey to include a visit to Machu Picchu, but coming in via a much less traveled route than the Inca Trail that offers unique views of the famous citadel. 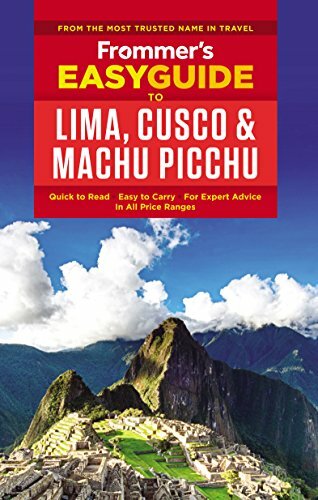 Machu Picchu is incredible but those looking for a hike that’s more unique and less restrictive consider some of these other incredible mountain treks in Peru – the best adventure hiking in South America! Every one looks amazing Meg. Peru is one of the prettiest lands I visited. I vividly recall stunning views of the Andes in Cusco. There are just so many options, it really is such a rich country in terms of culture, landscapes and opportunities for adventure. With so much on offer it’s always felt like a waste to me to spend your time on an area that’s become so diluted because of mass tourism. I’ve trek Nanda Devi last year, The trail to the base of India’s second highest peak, Nanda Devi that looms at an imposing height of 7,816 meters, is a grapevine to every trekker from different parts of the world. Peru is the #1 destination on my bucket list and Macchu Picchu is definitely part of it, but I love that you feature other mountains to visit too. I am in love with Rainbow Mountain! There’s no doubt that MP is a beautiful site, it’s just being aware of the reality that it’s affected by mass tourism, and perhaps not traveling with your expectations too high. I can also recommend Santa Cruz trek near Huaraz. A shorter trek (3 – 4 days) compare to Cordillera Huayhuash but very rewarding with stunning views and high passes. I love Huaraz! It is like a little Kathmandu of South America. There are so many hikes you can do there. And not touristy at all especially compared to Cusco. Hi Pete, thanks for the recommendation of the Santa Cruz trek near Huaraz. I’ll have to add that to my list! Cusco was great, but it was definitely touristy. I think hitting the main cities on your first trip is probably a given for most people, but hopefully we can convince at least some to venture out a little further! I visited in 2008 and hiked the Inca trail It was totally worth it! I disagree with this article. It says only 200 tourists a day (500 with guides) and then complains about not being able to take a photo with hundreds of other travelers? Ridiculous. The groups are spaced out. We rarely saw more than the 15 people (including porters) in our group until the last day of the trek. Plenty of photo ops. The trek itself is a bigger highlight than the city itself. Winay Wayna was my favourite. I’ve heard things have changed and they allow those who bus in to access the city earlier. When I went, we saw the sun rise over the EMPTY city and got to explore it for an hour or so before the “tourists” arrived. The other hikes sound really good as well but don’t just discount the Inca trail. I’m so glad you had a great experience :) Tbh I wish I had pulled the trigger and gone 10 years ago, but it’s one of those destinations that has been getting consistently worse year by year. 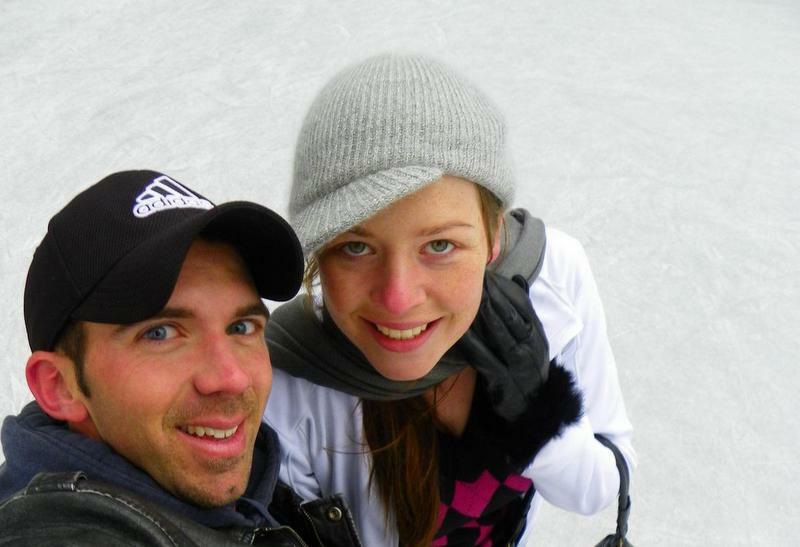 Mike’s been twice now; once in 2009, and then recently we went together as a couple, and the change he saw in just a short 7 years was unimaginable. That said, I’m glad I went when I did despite how much of a tourist trap (and obviously that’s a personal opinion) I feel it has become; the Inca trail obviously offers a higher level of freedom of space and that feeling of authentic discovery as just visiting on a bus, but the experience of visiting the actual citadel is now at the point where you can’t walk off independently and you have to stick to a very structured “in at X time, out by X time”, you stay with your guide and don’t leave the tour. I totally get that this level of control is necessary to preserve such a significant cultural site from the negative impacts of the mass tourism, but when it gets to that point the experience (for me personally) loses all appeal. I’m genuinely fascinated (and this is the same all over the world), that a site like Choquequirao which doesn’t have the name brand appeal as MP, but could be almost identical, doesn’t get built up, or attract the same level of mass tourism. It’s more of a challenge to reach, but it’s a larger ancient city, you can actually camp there onsite, and walk around the shrines and temples with literally no-one else. It has to be all in the marketing. That rainbow mountain looks surreal! I checked out the company you recommend and it looks like they also run treks to Machu Picchu too, so it’s cool that you’re honest with your opinion even though this is sponsored. I’m thinking I can maybe do the Inca Trail (because it’s been a dream of mine for a while) but also book a second trek on one that you recommend. Thanks for the tips! Glad we could help out with some potential inspiration for after you do the Inca Trail Don’t get me wrong, it’s a great site, and the trek is fantastic, but do travel with the realistic expectation that you’ll be sharing the experience with many other people, especially once you get to the actual citadel. In my opinion it’s gotten to be too much, but that’s not to say that other people won’t still enjoy it. My biggest message is not to travel with really high expectations as I’ve found that disappointment often stems from a disparity in expectations vs reality. I do agree with you, Machu Picchu is truly amazing but touristy, I always try to pick a destination that is much less travelled and have people say “so where is that? or I have never heard of that!”. Might be too late as I’ve booked. Gawd I was disappointed with Machu Picchu. Definitely had far greater expectations in my head. You’re not wrong that it’s descended into status as a tourist trap. Unfortunately. Don’t get me wrong, the site itself is an incredible wonder, but yes, I think the experience is getting worse year by year and really taking away from what it once was. There’s no sense of authentic discovery anymore, when I was there it felt very much like a theme park. We went to Machu Picchu recently and I wasn’t as impressed as I thought I should be… beautiful there, but maybe I was expecting too much. Yes I do think a big part of it is the hype surrounding it and as such we travel with really inflated expectations when the reality turns out to be much less. 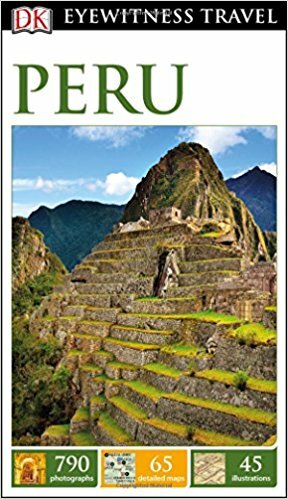 Meg Jerrard It takes everyone a lot of effort to get to Machu Picchu, in time and money, which ever way you get there…and then you can only spend the morning or afternoon there. It’s too rushed to be able to enjoy the trails and ruins, in what to most everyone is a once in a lifetime dream experience. 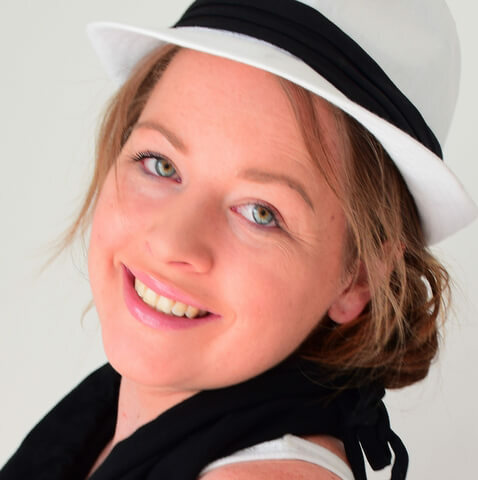 Absolutely, I feel the experience nowadays has become not dissimilar to a theme park – it’s like you’re shuttled through to see the attraction … just a very expensive theme park!